Neuroimmunol Neuroinflammation 2018;5:39.10.20517/2347-8659.2018.37© The Author(s) 2018. Department of Neurosurgery, Bangabandhu Sheikh Mujib Medical University, Dhaka 1000, Bangladesh. Azygos anterior cerebral artery (ACA) is type I variation of ACA with a reported incidence of < 1% in population. This variation predisposes to the formation of aneurysm especially at the bifurcation zone. The aneurysm develops because of double hemodynamic pressure supplying medial surface of both cerebral hemispheres. However reported incidence of saccular aneurysm in azygos ACA is between 13% and 71%[2,3]. It is often associated with other central nervous system (CNS) malformations like agenesis of corpus callosum, hydranencephaly and other vascular malformations. 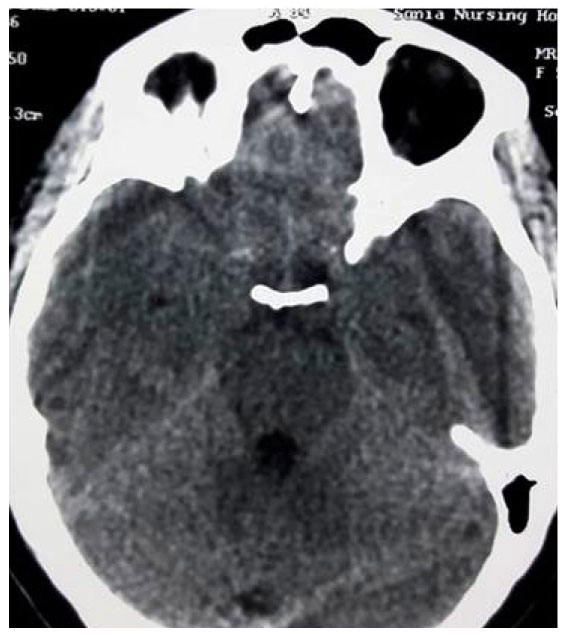 In this paper we report a patient who presented with subarachnoid hemorrhage. Later on we did three dimensional (3D) computed tomography (CT) image. She was then diagnosed as a case of azygos ACA aneurysm. 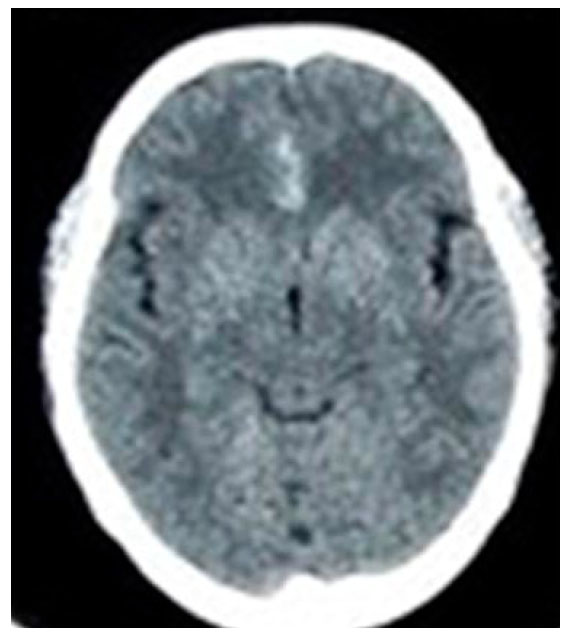 A 50-year-old female presented with a history of sudden onset of severe headache followed by transient loss of consciousness. There was no previous history of hypertension and diabetes mellitus. During admission she had mild dull aching headache and neck rigidity. There was no focal neurological deficit (Hunt and Hess grade-I). Four hours after the incident, CT scan of brain revealed subarachnoid hemorrhage in the basal cistern and hematoma in the interhemispheric fissure [Figure 1] which was Fisher CT scan grade 3. After 7 days of the incident repeat CT scan of brain was done which showed diminution of the size of hematoma [Figure 2]. At that time, a 3D CT angiogram revealed single saccular aneurysm from the bifurcation zone of azygos ACA [Figure 3A and B]. The patient underwent right paramedian frontal craniotomy and clipping of the aneurysm through anterior interhemispheric approach. After application of temporary clip on unpaired A2 segment, dissection of aneurysm neck was done and a curved fenestrated titanium clip was applied keeping the callosomarginal artery within the fenestration. There was no peroperative rupture of the aneurysm during dissection of aneurysm neck and fundus. Post-operative periods were uneventful. 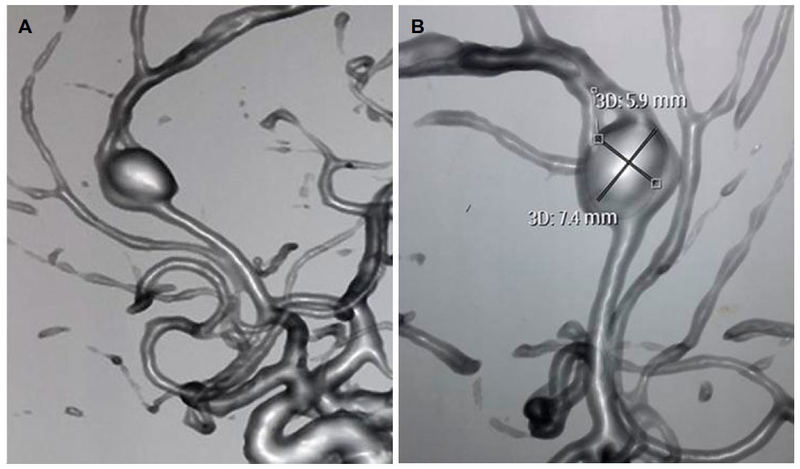 Two months after the surgery, we did 3D CT angiogram which showed the patency of the vessels and the complete obliteration of the aneurysm [Figure 4A and B]. According to Baptista, there are three variations of ACA [Figure 5]. Type 1 anomaly [Figure 5A] denotes azygos ACA from which all major vessels arise and supply both hemispheres. 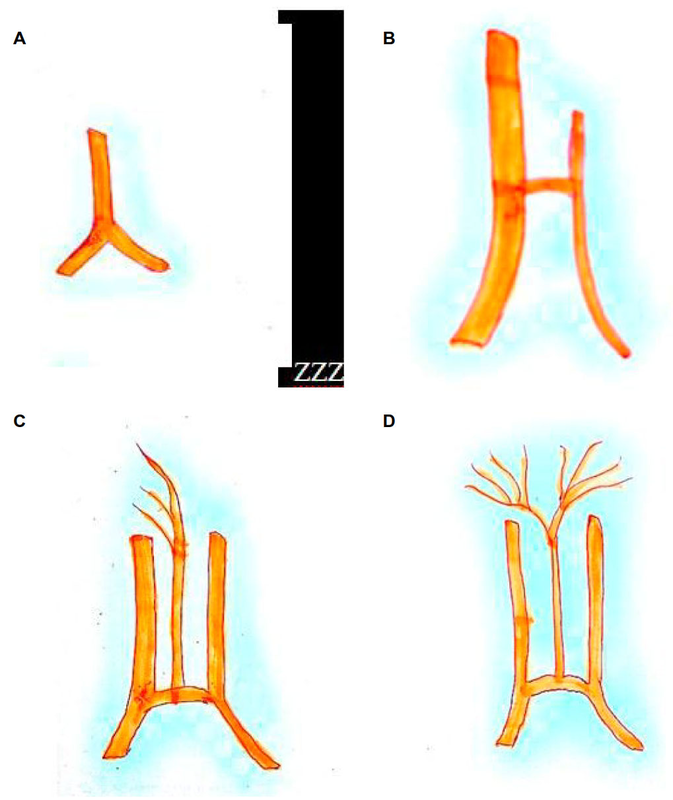 In type II variation [Figure 5B] both right and left A2 present and major branches supplying both hemispheres arises from dominant A2. Type III anomaly [Figure 5C and D] denotes accessory ACA arising from anterior communicating artery. In our case, the surgery was done on the basis of 3D CT angiogram findings and azygos nature of ACA was confirmed preoperatively. Though reported incidence of azygos ACA is < 1%, Ghanta et al. reported that 25% cases of distal anterior cerebral artery (DACA) aneurysms were associated with azygos ACA. Katz et al. found 17% ACA aneurysm among 36 DACA aneurysm cases. The nature of the aneurysm was mostly saccular. Although saccular bilobed aneurysm of ACA was also reported by Jagetia et al.. Both surgical clipping and endovascular coiling can be done to manage azygos ACA aneurysm. In our case, temporary clip was applied for 5 min in proximal unpaired A2 segment. Then a dissection of the aneurysm neck was done and finally a permanent clip was applied. There was no neurological deficit in her post-operative period. In conclusion, we can say that azygos aneurysm can be clipped well without any postoperative morbidity and mortality. Though we tried to manage this case in an emergency basis, we failed due to the patient’s poor financial condition. 1. Ozkal E, Erongun U, Acar O, Kalkan E. Ruptured aneurysm of an azygous anterior cerebral artery. Turk Neurosurg 1990;1:140-2. 2. Niizuma H, Kwak R, Uchida K. Suzuki J. Aneurysms of the azygos anterior cerebral artery. Surg Neurol 1981;15:225-8. 3. Huh JS, Park SK, Skin JJ. Kim TH. 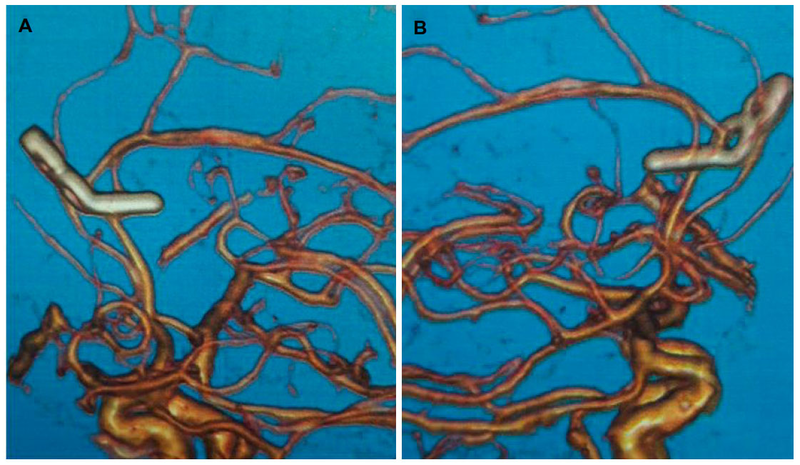 Saccular aneurysms of the azygos anterior cerebral artery: three case reports. J Korean Neurosurg Soc 2009;42:342-5. 4. Binatli Ö, Özer FD, Aydin M, Çiçek E, Binatli YC. Azygos anterior cerebral artery aneurysm with concomittant vascular anomaly: case report. World J Neuroscience 2013;3:49. 5. Baptista AG. Studies on the arteries of the brain. II. The anterior cerebral artery: some anatomic features and their clinical implications. Neurology 1963;13:825-35. 6. Ghanta RK, Kesanakurthy MV, Vemuri VN. Aneurysm of azygos anterior cerebral artery: a report of two cases. Asian J Neurosurg 2016;11:312. 7. Katz RW, Horoupian DS, Zingesser L. Aneurysm of azygous anterior cerebral artery. A case report. J Neurosurg 1978;48:804-8. 8. Jagetia A, Kumar PN, Sinha S, Sharma A. Saccular bilobed aneurysm of an azygos anterior cerebral artery. J Clin Neurosci 2007;14:777-9.